Firmware at test time was 3.8.1 Build 20121205. When I first hit the 469L's IP address, I thought QNAP had made some major changes in the admin GUI given the view below that greeted me. But it turned out to be just a bit of window dressing. Once I clicked through to the Administration option after logging in, the same familiar interface was there. The big addition in 3.8.1 is support for the previously-mentioned HD Station. This is QNAP's entry into the use-your-NAS-as-a-HTPC sweepstakes that some NAS makers are running these days. HD Station is a collection of modules that can be loaded to support various media playback features. The current modules are shown in the screenshot I pieced together below (that's why the two scrollbars), which appears when you mosey over to the Applications > HD Station section of the admin GUI. As he has with ASUSTOR and Thecus, Scott will soon be putting QNAP's media playback features to the test in another article. You can explore the V3 firmware's features in the review or online demo. We also covered MyCloudNAS in the TS-112 review. The TS-469L Pro was tested with 3.8.1 Build 20121205 firmware using our standard NAS test process. The Benchmark Summary below shows pretty consistent Windows File Copy performance for RAID 0, 5 and 10 modes. RAID 0 write shows the highest results at 108 MB/s, with 98 and 102 MB/s for RAID 5 and 10, respectively. File Copy read has a little more variance, but is still consistent at 104, 102 and 100 MB/s for RAID 0, 5 and 10, respectively. NASPT File copy results are higher than their Windows File Copy counterparts for write (133, 130, 128 MB/s) , but lower for read (96, 93, 93 MB/s) for RAID 0, 5 and 10 respectively. iSCSI target write performance to target created on a RAID 5 volume came in at a very respectable 101 MB/s, with read much lower at 82 MB/s. As a test, I ran the full suite of benchmarks against an iSCSI volume, with surprising results described here. Best attached backup performance of 112 MB/s was obtained with eSATA / NTFS and USB3 / FAT. The speed of the USB 2.0 connection limited the performance with all three formats to 27 - 28 MB/s. Rsync backup to the NAS Testbed running DeltaCopy acting as an rsync target came in at a typically-measured 38 MB/s. Although the competitors change positions from benchmark to benchmark, results are close enough that it would be difficult to detect a significant performance difference among the group in real-world use. QNAP seems to sprout new NAS models faster than dandelions in a spring rain. But this sometimes this can lead to buyer confusion. 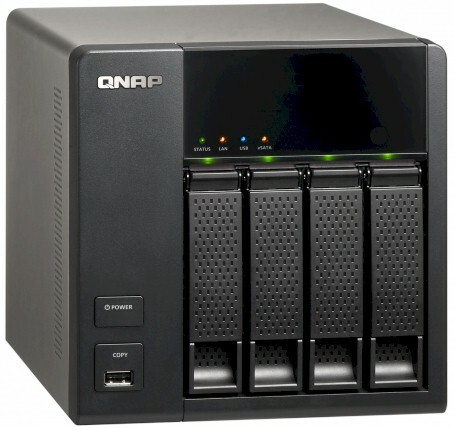 If you're considering a four-bay QNAP NAS, you have the five options shown in Table 2 to choose from. Unless you really, really, really want lockable drive trays and a display screen, at least among this group, the TS-469L is the obvious choice.